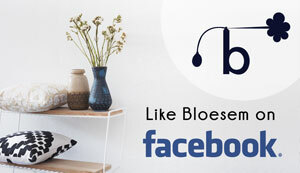 Yesterday I mentioned Nell in a post on Bloesem. Nell is a collection of clothes, accessories, home wares and baby wear ! 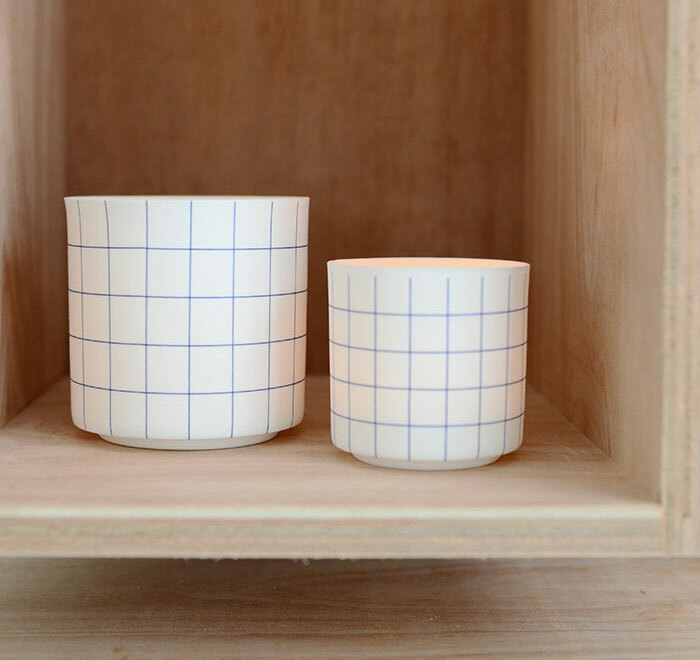 This Sydney based shop was founded in 2004 by French-born designer Emmanuelle Flahault. Playing with fabrics and colours has occupied her since she was a child, when she used to amuse herself in her grandmother’s wardrobe and disappear into the attic, sifting through for inspirational things. I love the animal pillows! ..contact Nell for more information..
A quick Thank You to Kellie from BuisjesEnBeugels+++ for sending Lode this great grey sweater. We like it very much and he is giving you Kellie some 'beautiful eyes'...he just learned how to blink his eyes when we ask him to do 'beautiful eyes' (little note from a proud mom!) 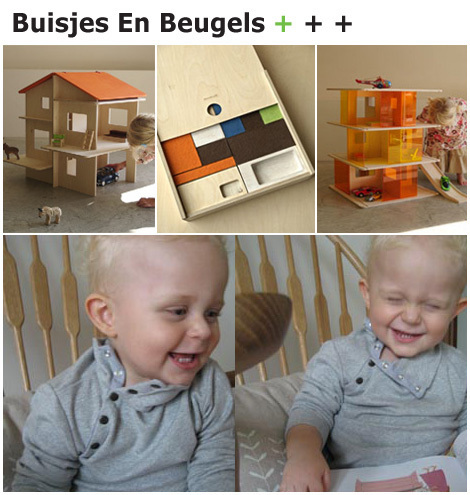 BuisjesEnBeugels+++ is a Dutch kids designer label founded in 2005 by Kellie Smits. Kellie told me they recently started selling the incredible toys from Swiss brand Momoll via their online shop! But you should definieltu visit the website to view the new 2008 spring collection. 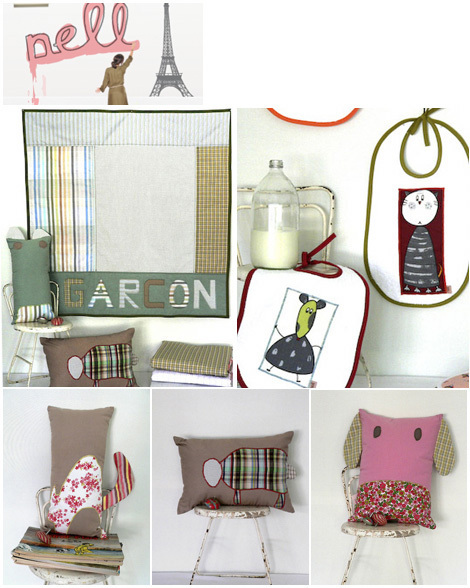 Sarah Jane...her mantra: vintage characters...modern simplicity...fresh color! 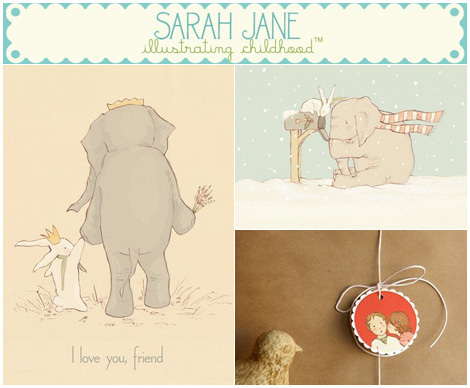 Sarah Jane's beautiful and detailed illustrations are perfect to hang in your children's bedroom. They are so lovely and Sarah's work reminds me of some books we had at home when I was growing up, like the ones from Dutch illustrator Rie Cramer. m·o·m ...a very appropriate name for this super cool shop! m·o·m is a partnership between mother and daughter, Tere and Bethany Jensen. 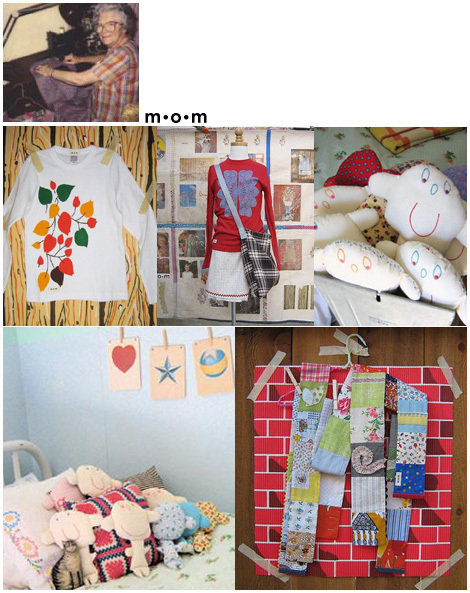 They live in the small southern California beach town of Cardiff-by-the-Sea and make clothing and accessories for young girls (age 4-10) as well as a few decor items. The screen printed images on the t-shirts are of childhood drawings, vintage family lace and inspired designs from our vintage fabric collection. 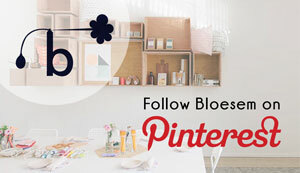 I'm glad Bethany sent me an email and I enjoyed their blog, website and story! 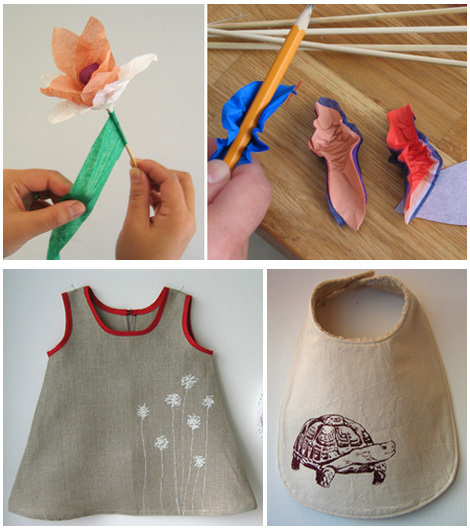 With winter still around in Toronto Arounna couldn't wait for spring to arrive so she decided to make some fresh flowers together with her son, would you like to know how she did this, just click here! And I don't know how she finds the time to do all this she also made some new gorgeous children's wear like the little dress, available at Bookhou Kids. ..Special page where all Arounna’s craft projects are posted..
OneLuckyHelen...that's the name of Helen Dardik's website and this women I think is all about optimism, positivity and colors...her statement: "Being creative is necessary! Life is to short". 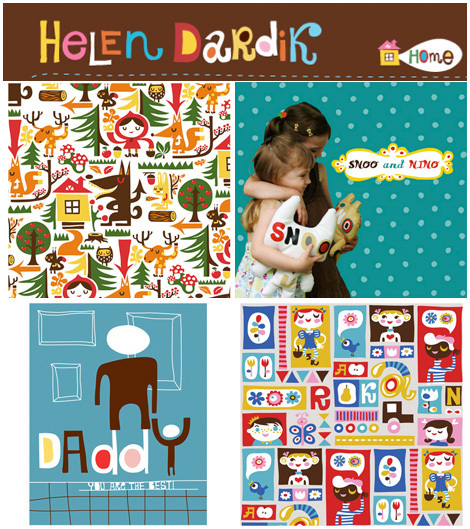 I'm so glad Helen contacted me...her illustrations, pattern designs, paintings and soft toys are a feast for the eye! Helen was born in Odessa by the Black Sea and spend some time in the bitter coldness of Siberia, but she moved to Israel and studied at the school of art and design in Haifa. Currently she lives and works in Canada. 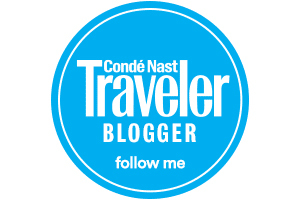 Have a look at her website and you will get a happy feeling.